Whether you’re pounding the pavement at home or trekking through the deepest jungle, a healthy body and the right equipment provide you with the energy and tools for adventure and travel. Hiking boots for men are specifically designed to complement certain body mechanics and therefore achieve stability. Hiking is something most men pick up later in life. Some prefer the tranquility and peace nature has to offer. So, being prepared with the right hiking boots will make the adventure even more fulfilling. It doesn’t matter how fit, willing, and adventurous you are, if blisters are ravaging your feet the day loses its excitement. The human foot is an intricate structure of 26 bones and 33 joints, and many muscles, ligaments, and tendons. Even otherwise healthy feet can be more fragile than we would like to think. Pain can dampen the excitement of a vacation or walking trip. Shoes that don’t fit properly will not only irritate your feet but can cause knee, hip, or back problems. 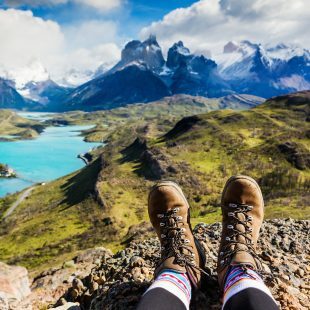 Before heading out on a hiking trip put some thought into your feet. The most common cause of pain in feet comes from wearing the wrong type or fit of a shoe. Check that your toes can move and are not hitting the end of the shoe, but ensure your heel doesn’t slip around. Make sure there are no points where the shoe pinches your foot. Walkers hit the ground heel first and roll to the toe, so the sole should have more flexibility than a runner’s shoe. A low, supportive heel that rounds in helps your foot roll forward smoothly, which is important to help prevent pain or injuries. If new shoes are needed, consider shopping for your walking shoes at the end of the day when your feet may be slightly swollen. Be sure to wear the same type of socks you’ll wear hiking and take your time while shopping. Walk around on a hard surface, assessing how the shoe feels and responds. Finding the right shoe may feel like a chore, but will be worth it after hours of hiking. Being prepared frees you to enjoy any experience and expedition that comes your way. Strength and versatility help you make the most out of a once-in-a-lifetime vacation or a weekend getaway. 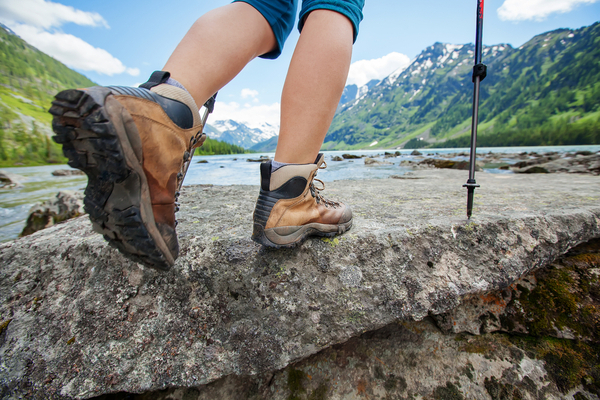 Don’t let blisters and sore feet prevent you from getting the most out of every trip.